Dir. Lee Tamahori. Belgium. 2011. 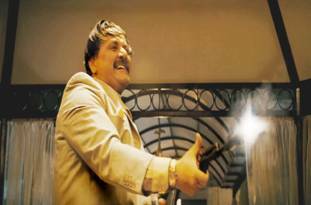 Caligula meets Scarface in this garish depiction of Uday, Saddam Hussein's crazy and dangerous elder son and Latif Yahia, the former schoolmate and lookalike forced into Uday's entourage to act as his "fiday" or body double in a symbiotic and explosive love-hate relationship. Dominic Cooper of The History Boys and Mimma Mia gives a brilliant performance as both men in a movie full of menace and mind-boggling set pieces. The Devil's Double is a feast of wretched excess, a virgin deflowered on her wedding day, kidnapped and raped schoolgirls, a disemboweled rival, guests forced to strip naked at a birthday party, beatings, torture, suicide attempts, drawers full of costly watches, tables brimming with cocaine, and constant mindless violence. If you have the stomach for it this is an Iraq movie to remember. It's also a leap forward for rising star Cooper. The energy of unhinged violence is tremendous. On the other hand there's not not much time taken to provide suspense or analysis. Saddam, his regime, and the wars and oppression, the plagues and benefits for the Iraqi people stay on the sidelines where they may indeed mostly have been for the narcissistic, supremely self-indulgent Uday and for Latif, trapped in a hall of mirrors. The Devil's Double takes the audience deepest into its protagonist's experience in the first few scenes. Later the spectacle tends to overwhelm the inner exploration, but it's a memorably vivid moment when the dignified, battle-weary Latif Yahia, an army lieutenant, is brought direct from fighting in the war with Iran to the presidential palace and interviewed by Uday, who gives him ten minutes to decide if he accepts the job of being his stand-in. The movie effectively puts us on Latif's side, so that Uday seems a weird, scary creature, with Cooper's tour de force in playing both in the same scene very arresting and fun to watch. Cooper's Uday is greasy, bucktoothed, squeaky-voiced, grinning, impulsive. His Latif is dignified, handsome, appalled. There is nothing he can do to resist but he does. He's beaten and tortured, and told Latif is dead. He can't contact his family. They are to think he's died heroically. Later, Latif, fitted with fake front teeth and experienced at observing the young madman in action, learns to mimic Uday and can even pose as him to motivate Iraqi troops to attack Kuwait. Grainy documentary footage, a little unreal in contrast to the bright, glittering scene of palace parties, runs in fast sports cars trawling for high school girls, and violent clashes with underlings, fill us in on the Gulf War and the declarations of Bush the Elder. As time goes on, what it's like to be Latif is harder for us to guess as the spectacle takes over and the fascination of the movie becomes the oscillation between the crazy Uday and the uneasy Latif. He's told by one of Uday's henchmen that he can have many women but must not so much as look at any Uday is interested in, but as he becomes a hostile, combative, disapproving, yet favored member of Uday's entourage, Latif somehow also becomes the lover of Uday's girlfriend Sarrab (French actress Ludivine Sagnier, effective in a variety of wigs and die jobs). Sarrab is another prisoner of Uday's unhinged impulses, but why then can she and Latif become a couple? Uday remains opaque, a bad boy so libidinous and immature he rapes schoolgirls and cuddles in bed with his buxom mother. The movie ignores various details of Uday's life, which however may have been nearly as lurid as depicted here. Though it's a vivid, good-looking, well-acted film with several scenes you'd like to forget but can't, The Devil's Double lacks the endless and varied excess of the Brass-Guccione Caligula or the extended set pieces of De Palma's Scarface. When Sarrab and Latif run off this begins to seem like another more standard-issue movie of double-crossing gangsters. New Zealander Tamahori, whose sad modern Maori tale Once Were Warriors remains his milestone, is good at individual scenes but not so adept at pulling them together into a meaningful whole. The film was shot on Malta and in Jordan. The screenplay by Michael Thomas is adapted from a novel of the same name by Latif Lahia, who has survived and now lives in Ireland. The Devil's Double was released in the US July 29, 2011; in the UK, August 10.